As the skin bled with a .75mm stamp I assume I punctured the dermis thus achieved my intention of inducing the repair process and collagen? I confess I did stamp quite strongly. In view of this, is using a 1mm stamp unnecessary? And is rolling unnecessary too as the stamp seemed to do its job? Further to this I have just read the 'Dermarolling instructions' PDF dated 4th July 2011. It suggests a 0.5mm roller can be used once or twice a week on the same skin area and a 1mm every 2 weeks. I have both a .75mm and 1mm stamp. Given all the information I have written down here, would stamping with a .75mm once every 10 days be an appropriate course of action? Whenever I receive a question about scars on the nose, I get nervous.. The problem is, that the skin on the nose reacts very unpredictably comparing to the rest of the skin. Nasal skin can heal worse than you started with. There is no fat layer under that skin, there is only cartilage and that might be the reason. Skin procedures on the nose are always risky. 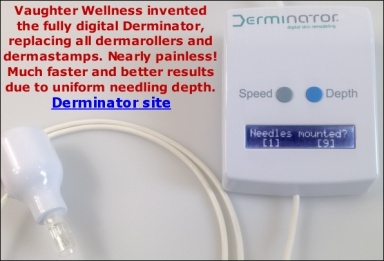 I can only suggest this: Use the single needle on it but do not do any aggressive needling. Concerning the nose, ignore the guidelines for needling that are on our website. Make just three pricks into your scar (to the bottom of the scar). If it heals well, make four pricks the next time. If it heals well, make five pricks the next time. Continue like this but never do aggressive, dense needling. Just a few, very gentle pricks. You can replace the single needle with a 1.5 mm dermastamp (or shorter length) but the same rule applies. Start slowly and never dermastamp aggressively. Do a test patch first. Using a 0.75 mm dermastamp every ten days is OK.